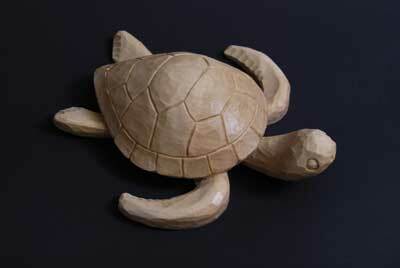 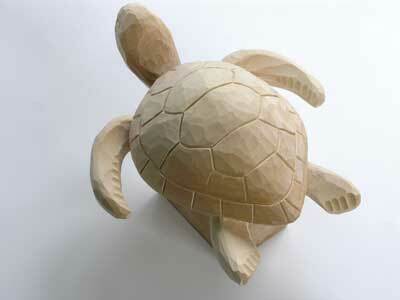 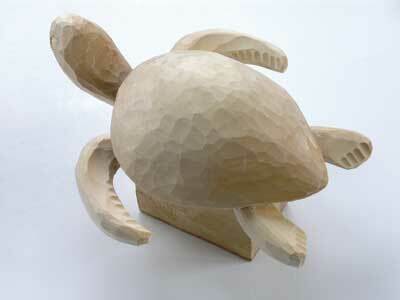 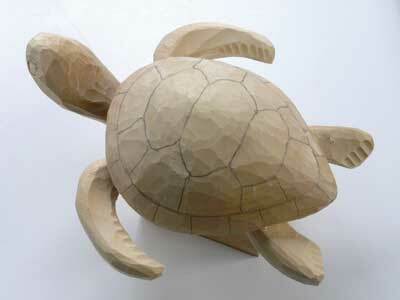 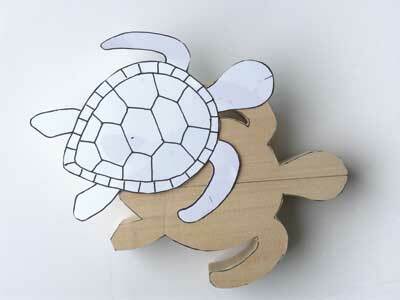 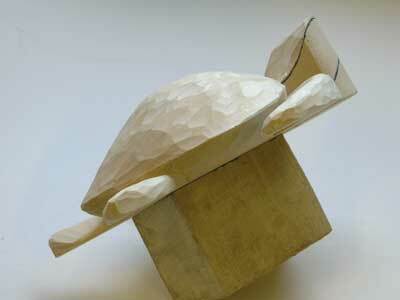 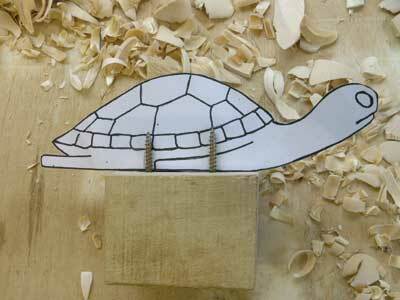 This turtle has the advantage of having a flat base so while being three-dimensional, it can be carved like a relief. 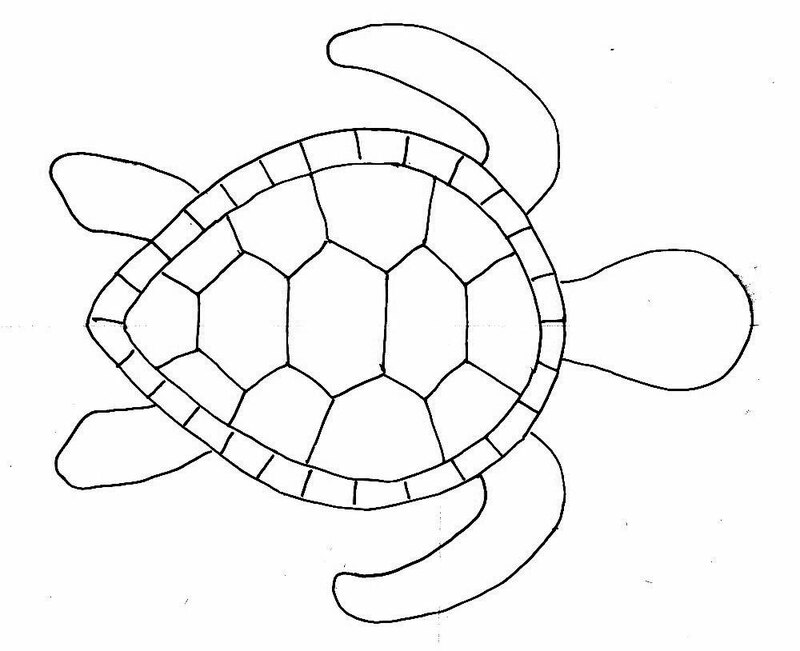 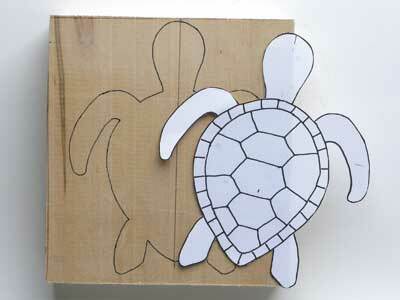 Having only seen a turtle in a sea life centre, I resorted to the internet to help with the design. 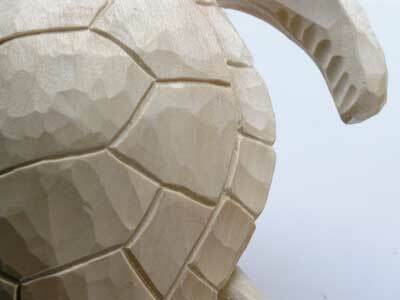 I first looked under 'Images of Turtles' in my search engine and then under 'Anatomy of Turtles'. 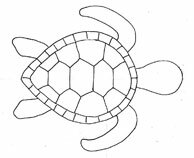 With a few hours to spare it would be possible to become an expert, if not a bore, on all things turtle, but I was selective about the information I used and the result is an amalgamation of a few different turtles. 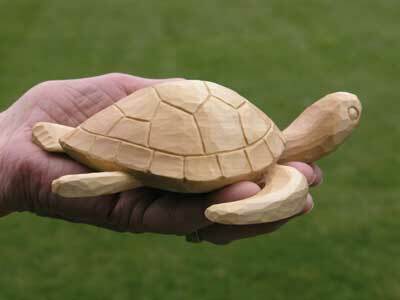 The timber is lime (Tilia spp) 50mm (2in) thick and although this is probably rather light in colour for a turtle, it has the advantages of being easy to carve and taking detail well. 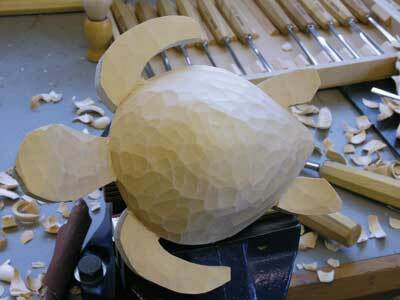 The final piece could be stained or even painted if more realism is preferred. 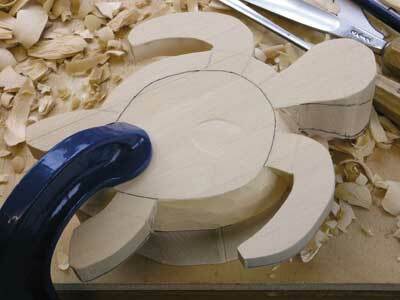 Before starting to carve, make sure you have all the holding devices to hand. 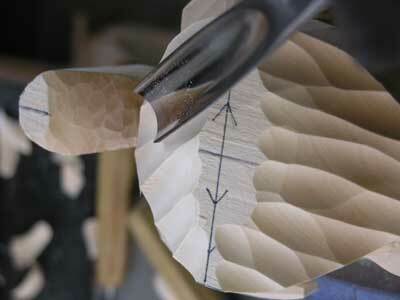 This will depend on how you like to work but here a G-clamp was used to hold the work to the bench for the initial carving and then a small block with two screws through it fixed to the base enabled the piece to be held in a bench vice. 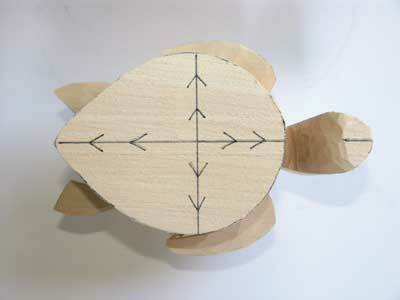 Decide how big you want the carving to be and make a couple of prints of the template. 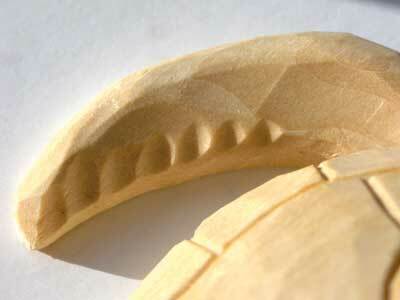 The size may be governed by the available timber but I suggest it is at least 150mm (7in) long as smaller than this will result in the flippers being a bit weak and tricky to carve. 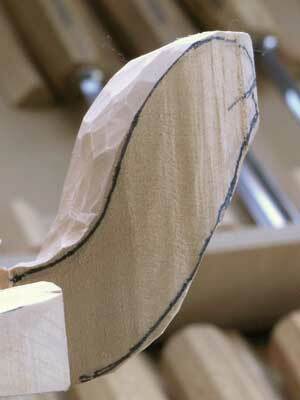 I tried to work with as few tools as possible and you will find other, similar size gouges give results just as good. 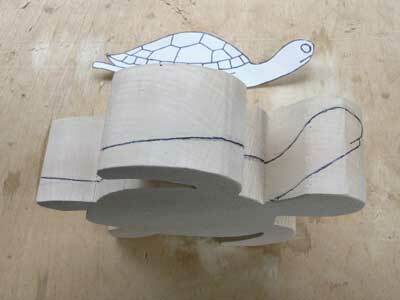 Because the project is designed to be finished in a couple of days, this example is left tooled but if you have more time, you might like to sand the shell. 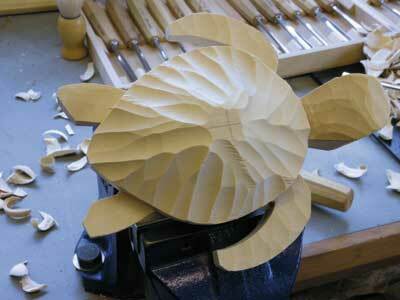 The photographs show the sequence in which I worked but carving the head and flippers can really be done at any time after the shell has been shaped, but do take care not to lean on them once they are a little thinner as they are the most vulnerable parts while the carving is still fixed to the block. 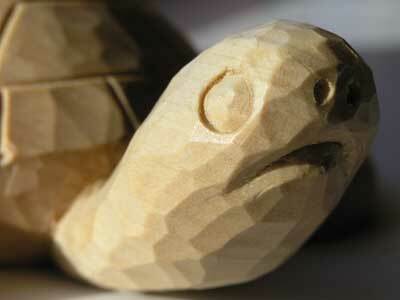 The markings on the flippers and the eyes are all carved using a No.8 7mm gouge. 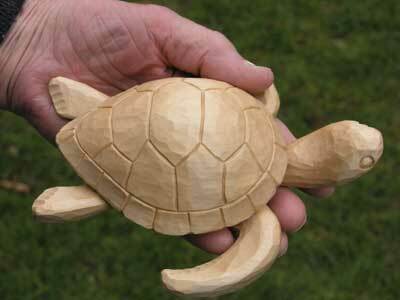 Finally the piece was finished with two coats of Danish oil and when that was dry, a light rub over with neutral wax polish was applied. 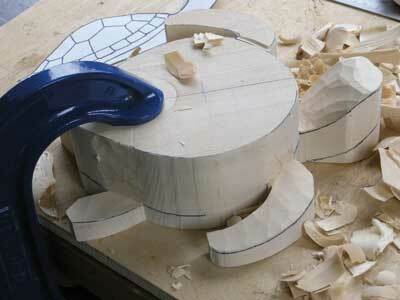 "Before starting to carve, make sure you have all the holding devices to hand"